Buy about one pound per person, or a pound and a half per person if you have hearty eaters or want plenty for leftovers. If you are serving more than one type of meat, you should probably buy the lesser amount. For large gatherings where there will be a combination of adults and children, figure one pound per person to allow for the large and smaller appetites. If the turkey is pre-stuffed allow 1 1/2 pounds per person. Buy 1/2 pound per person for bone-in turkey breast. A frozen turkey can be bought months ahead and stored in the freezer but a fresh turkey should be bought only one to two days ahead. Fresh turkeys may be frozen for up to 12 months. 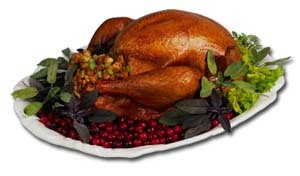 There are basically two types of raw frozen turkeys on the market  pre-basted or un-basted. A pre-basted bird is injected with water, broth, vegetable oil and/or spices to enhance flavor and moistness during cooking. An un-basted turkey has no additional ingredients. Read the label. Look for the USDA Grade A symbol on the label. Grade A turkeys are of the highest quality. They are meaty, have well-developed layers of fat, and are nearly free pinfeathers, bruises, cuts, tears and broken bones. All turkeys on the market are young, 4 to 6 months old. A fryer-roaster turkey is under 16 weeks of age. Most experts agree that a hen turkey is a better buy than a tom. Hens are generally weigh less than 16 pounds and a tom turkey is usually over 16 pounds. Toms are larger with larger bones and less edible portions. However, age not gender is the determining factor where tenderness is concerned. Wild turkeys differ from their domestic counterparts. Wild turkeys run and fly so they have much less fat and have a tendency to be very dry when roasted. Exactly how to cook a wild turkey depends on its size, its age and whether it has been plucked or skinned. Most wild birds benefit from a moist heat method such braising or using an oven cooking bag. Smoked turkeys are fully cooked and simply need to be heated unless the label says otherwise. Turkeys are smoked to impart flavor, not to extend the refrigerator storage time. Store a smoked turkey in the refrigerator, unwrapped, for up to one week. Once the package has been opened, use within three to four days. Turkey breast, boneless breast, legs, smoked legs, necks, stuffed breast, wings, smoked wingsyou name it. Turkey is so popular it also comes as turkey bacon, turkey ham, turkey sausage, ground turkey and turkey burgers. If you've decided to cook turkey parts instead of a whole turkey there are a few differences. If using an oven-proof food thermometer, place it in the turkey at the start of the cooking cycle. It will allow you to check the internal temperature of the turkey while it is cooking. Raw turkey breasts cooks faster alone. It should be cooked to an internal temperature of 165°F. Use a food thermometer and check the temperature by inserting in the thickest part of the breast. Breast meat cooks faster than dark meat and will dry out if over cooked.